Felicity Peake was appointed Director of the Women's Auxiliary Air Force on 12 October 1946, following a meteoric rise through the ranks. At 33, she was remarkably young for the post but proved herself more than capable, using her influence to achieve much in a short space of time. As Director, she oversaw the demobilisation of the auxiliary wartime service and was responsible for implementing plans for a permanent peacetime force. 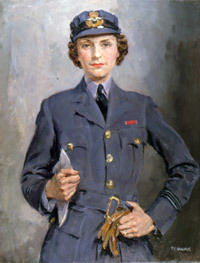 In February 1949, the Women's Royal Air Force (WRAF) was formed and, with her drive and energy, Felicity Peake was the natural choice for its first head. Her main priority was integration with the RAF, particularly in relation to pay and conditions. Felicity Peake was adamant that their rates of pay be linked to the men's "otherwise there would be a battle over every issue". Her pragmatic approach enabled the same conditions of service to be applied to both sexes, and allowed women to qualify on equal terms for careers and long term service. In fact, the administrative structure instituted by Felicity Peake was so effective that it remained little changed during the life of the WRAF. Felicity Peake retired from service in July 1950. In her two years as WRAF Director she had created an efficient peacetime force that was fully integrated with the RAF, to the extent that WRAF officers were given the same status and power of command as their male counterparts. Her achievements were formally recognised when she was made Dame of the British Empire (DBE) in 1949. "Architect of the permanent WRAF"